Powerex OTD1006C2 oilless air compressor 10HP 240 gal. 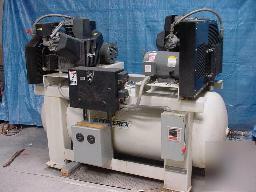 Subject: Powerex OTD1006C2 oilless air compressor 10HP 240 gal. Please use this number in any correspondence. Wired for 460V AC, 60Hz, Phase 3 power. For more details on this unit CLICK HERE. The tank has the following specifications 240 Gallons at 200PSI. Compressor Pump One has 201.3 Hours Recorded. Compressor Pump Two has 179.8 Hours Recorded. This unit comes with Two Baldor Motors. There is extra set of pulley belts included. For details on this unit in PDF format CLICK HERE and start on page 9 in the document Duplex models. No manuals or other accessories are included. See pictures for additional information. It has been tested and is working correctly, these have less than 210hr each!!!!. It is in good physical condition. Anything not in the pictures or description is not included.